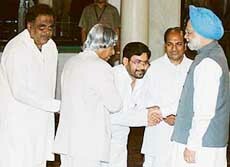 Dr Manmohan Singh. PM, moved senior Congress leader Pranab Mukherjee to the crucial External Affairs portfolio and brought back former Kerala CM and Union Minister A.K. Antony as Defence Minister. The government today reiterated that no middlemen would be allowed in defence deals and that in all the deals which would be cleared, the sellers would have to sign an integrity pact, binding them not to use middlemen. In a new twist to the killing of Orissa DIG Jaswinder Singh, the involvement of Naxalites was ruled out and his two personal security officers (PSO) were arrested and slapped with charges of murder. The DIG was reportedly shot dead by one of the PSOs. India today expelled Mohammed Farooq, a driver with the Pakistan High Commission here, for activities “incompatible” with his status - a term normally used in diplomacy for espionage. The police today opened fire to disperse protesters who pelted stones and torched a police van after it ran over a father-son duo, fatally injuring them, in Mehboob Colony here. It will now be a working day tomorrow in all Central Government administrative offices located in Delhi and New Delhi, as it remained closed today on the account of Id-ul-Fitr instead of tomorrow, a PIB statement said. Screaming advertisements like “Fly to London for Rs 18,000 and to New York for Rs 33,000” notwithstanding, the actual ticket to any of these destinations would be 30 to 45 per cent costlier than the publicised fare.